The ultraslim notebook can be pre-ordered at B&H and Newegg. It is powered by the Core i7-7700HQ quad-core CPU coupled with up to 16 GB DDR4-2400 RAM, and comes with a 512 GB NVMe SSD, on top of the 1 TB HDD. It also features the GeForce GTX 1050 4 GB GPU, so it can handle some light gaming. The 1080p multi-touch display version costs US$1,699. The Asus ZenBook PRO UX550 notebook was initially announced back in May, and now it is up for pre-orders on B&H and Newegg. 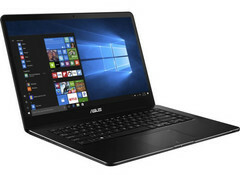 The ultraslim and slick model features a case that measures only 0.74 inches in thicknes with an overall weight of 3.97 lbs, but this didn’t stop Asus to fit a Core i7-7700HQ quad-core CPU, up to 16 GB DDR4-2400 RAM, a 512 GB NVMe SSD and the GeForce GTX 1050 4 GB GPU inside it. Pre-order prices start at US$1,699 for the 1080p display model, and shipping will begin on October 13.